They came and they kept coming. 847 sleds in total took part in the Science Hill Drifter’s Guiness World Record attempt for longest snowmobile parade. And it looks like a great time was had by each and every one of them! Video created by AV Marketing Inc.
To see more photos and videos of this amazing feat check out the Science Hill Drifters Facebook Page and their website. Congratulations to everyone involved! Ontario is home to several Guinness World Records such as the world’s longest wheelie by a car , the longest winter road, the longest naturally frozen ice rink and not surprisingly the world’s fastest snowmobile. It should come as no revelation that we Ontarians set world records, we are by nature always trying to innovate and push the limits of what was previously thought possible. Many parts of our great province hold onto the winter season for up to 6 months, allowing plenty of time for the world’s largest interconnected trail network to develop. This lengthy winter season and climate guarantee us plenty of time to set up and set a world record. In 2011 Nicholas Musters set the world record for the greatest snowmobile distance covered in 24 hours. Nicholas rode 3,069.12km on Muskoka’s Lake of Bays in 24 Hours. For many of us 3000km is an entire season of great rides and beating this record is completely unfathomable. In 2004 on Lake Nipissing, Chris Hanson set the world record for the fastest snowmobile travelling 277.13kph; the vast majority of us will only achieve this speed by travelling on a commercial airliner. So how would the average snowmobiling loving rider go about being a part of a Guinness Book of World Records snowmobile record? Here’s how! 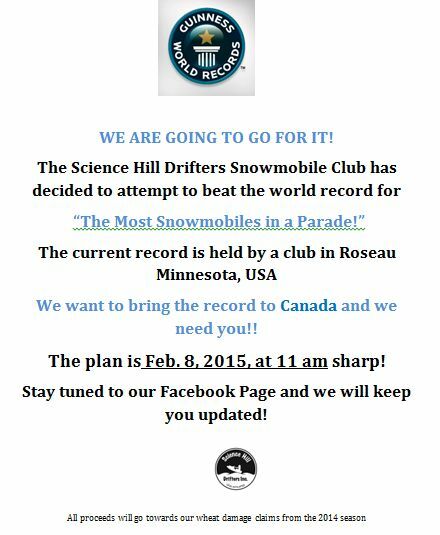 On February 8th 2015 the Science Hill Snowdrifters of OFSC District 5 will attempt to beat the current record of the longest parade of snowmobiles which was previously set by the USA based Rosseau Country Trail Blazers Club in 2004. The current record consisted of 820 machines completing a 46.6km course. Here in Ontario we have over 32,000km of trail—an incredibly lengthy course and thousands upon thousands of snowmobilers. Is Rosseau’s record possible to beat? I think us Ontario Snowmobilers have the ability. This will be no easy task and the Science Hill Snowdrifters need all of our help to make it happen. Location: Science Hill Snowdrifters Clubhouse on B111 Trail. Multiple Staging Locations will be set up nearby, Riders are encouraged to ride to the clubhouse on their snowmobiles as truck / trailer parking will be limited. For more information check their website or Event Facebook Page. I spoke with Dwayne Lawrence of the Science Hill Snow Drifters about their plans for the attempt and to gain a little more knowledge about how significant this record will be to the club and Ontario, Canada. Q – Dwayne, You need over 820 snowmobiles to form a continuous parade? How will you accomplish this? The day of the run (Feb 8), we will have lanes set up at the clubhouse and will be organizing all of the sleds so that the start is not a scramble. The guidelines Guinness has laid out are quite specific. The actual rules will be rolled out shortly. We are currently planning on leaving the clubhouse and following our trail system to intersection #209 where we will finish at McIntosh Power and Leisure. This is just over 10km. We anticipate that the event should take about an hour to complete. Q – What about parking for all the snowmobiles, truck and trailers? We are aligning multiple parking locations within a reasonable distance from our clubhouse to support the event. We generally are well supported by businesses in the area that have space for parking when we run events. We are encouraging local participants to ride in so that parking is available for those travelling by trailer. These will be published in the next few weeks as well. Q – It’s $10 to register for the event, a small fee to be a part of something very big! What will the Science Hill Snowdrifters do with any proceeds? We plan on making this a club fundraiser to support the financial loss we incurred last year with major groomer repairs (axle bearings, tires etc.) and a near record year for wheat damage – we had almost 12 km of trail with damaged wheat! Funny how things work in reverse of what people would think – more snow = more grooming hours, breakdowns and crop damage! It appears our base on our trail system was so hard packed that the wheat didn’t breathe over the winter and in many spots there was zero growth in the spring. Obviously, keeping our landowners happy is a priority. Q, I hear that the Science Hill Snowdrifters are not the only club trying to beat the USA based Rosseau record, who else is trying to break this record? We also have some Canadian competition…Whitecourt Trailblazers in Whitecourt Alberta are also holding a similar event on Thursday Feb 12. We need our turnout to be strong as the competition is getting stiffer! 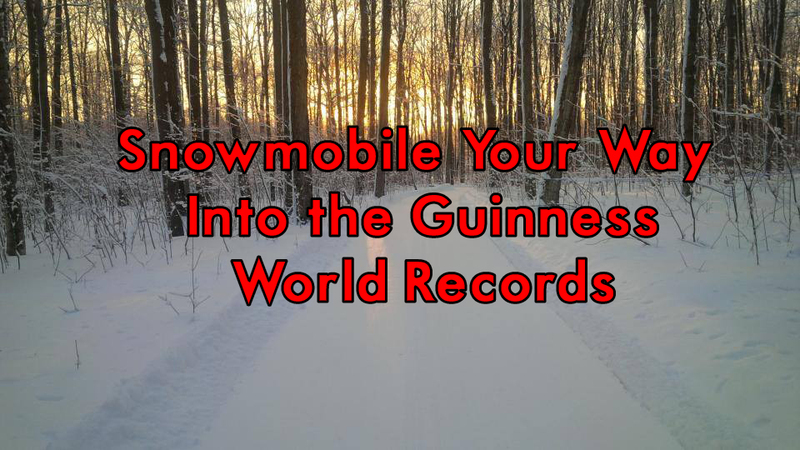 If you have always wanted to be a part of a Guinness World Record and have a snowmobile this is your chance! Save the date, corral your buddies, shine up your sleds and bring the record for the Longest Snowmobile Parade to Ontario!